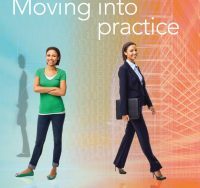 While many students take the LSAT and if accepted, go to law school after completing a first degree, some choose a different path. Many law students take a few years off in between, for several reasons, including making sure this is the career they want. 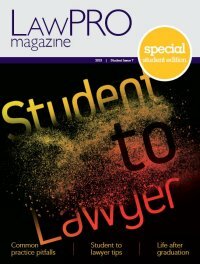 Last year’s LawPRO articling students, along with one of LawPRO’s current articling students did just that. we sat down with Maurizio Artale, Andria Cramer and Benjamin Hutchinson to discuss the benefits of waiting a few years to go back to the classroom. Maurizio did a masters in political science and while he was thinking about going to law school he wasn’t 100 per cent sold on the idea. So, he worked for the Canadian government at Industry Canada and the Department of Northern Development and Indian affairs. after working in government departments for almost five years, Maurizio decided it was time to head back to school and decided on Osgoode Hall Law School. Andria first completed a law clerk and paralegal program. She was always interested in law school, but, similar to Maurizio, wanted to make sure it was the right decision for her career. So she decided to try working in a law office setting and confirm if she was still interested. She was working as a legal assistant for Research In Motion (RIM) when she applied to law school. After being out in the workforce for a few years, she knew there was a new challenge out there for her and chose to attend the Faculty of Law of the University of Ottawa. While some people may worry that being out of the classroom for a few years will make it hard to get back into the habit of study, there are many skills you can develop while working in an office setting that will help when you’re back in school. Like Maurizio and Andria, Benjamin completed other degrees (a masters in political science and a bachelor of education) before attending Osgoode Hall Law School. While Benjamin admits it can be a bit of a challenge to get back into school mode, learning soft skills (especially communication skills through teaching) before going back helped him succeed in law school. Maurizio adds that experience gained working in an office or volunteer setting can be a career asset. He volunteered with legal aid at Osgoode and was able to develop relationship skills for working with clients – a task that many first year students find intimidating.